As I was finishing up the bulk of the siding in mid-June, I should’ve been reading up on electrical and starting to buy materials for the interior. But I wasn’t. I told myself I was just focusing on finishing the exterior, and then I’d get to that. Then I told myself it was okay to take some time to enjoy my summer. That it was okay if the build took longer so long as I was enjoying my life. There are so many reasons the build has taken as long as it has, and I can’t change the past. But I do have (some) control over my future, and I no longer imagine the tiny house in it. Somewhere along the line, the picture changed, and I hit a wall with the tiny house. I have put all of the time and money into the tiny house that I’m willing to, and now it’s time to move on. I waited to write this post, because I wanted to be sure and because I had to figure out what I wanted to say. I learned so much building The Lilac. I learned how to find information, teach myself, practice, work with my hands, manage large amounts of money, work hard, and be assertive. But I don’t feel the need to become an expert on electrical and plumbing, I don’t want to spend more time building, and I’m certainly not going to pay someone else. The tiny house is fully paid off, and I have no interest in going back into debt for it. I’d need thousands more for electrical, plumbing, insulation, flooring, interior siding, appliances, not to mention the time I’d spend building furniture and cabinets. I’m going to take a break from building for a while. I’ve had my fill for now. When I first came across tiny houses, I was 16, and you could build one for less than $20,000 (I’ve spent that much on just the exterior). My plan was to build a tiny house in a year, maybe two, then pick a school, move the tiny house nearby, pay a small amount of rent, and live in it for at least four years while I went through university. I’d save money and I’d have my own custom-designed, private space. I could continue to live in the tiny house until I didn’t want to anymore, then I could keep it in the backyard of a bigger house and use it as an office or guest house. But it’s already been over two years, and I’d need at least another year to finish the interior. I haven’t had the freedom or privacy of my own space this entire time, so it’s gotten to the point where it’s not worth it for me to continue. Tiny houses are still a legal grey area as well, so I wouldn’t have as much flexibility as I want either. I couldn’t live in a city, or close to town because the bylaws are stricter. I want to be able to live close to conveniences, and I want to be able to sell everything I own and go travel or live abroad. I can’t do that easily if I have a tiny house that needs a parking spot and rent paid. I bought a nicer car, I make good money working six nights a week at a restaurant, and I moved into an apartment within walking distance of my job. I have a bedroom with a little balcony off it, I have my own kitchen and bathroom that I don’t have to share, and I finally have my own living/dining/office space that’s not two feet from my bed. The bedroom door has purple glass panels in it (oh how I love unique details) and the rent’s not too expensive. I have the freedom, flexibility, and privacy that I wanted. Now I’m taking my free time and money back, and I’m moving on. The tiny house was good for me, it gave me purpose when I needed it, but now it’s time to sell the shell. Anyone interested in buying a tiny house shell on wheels to finish can contact me through my About Me page. P.S. Before I made any decisions, I was included in a tiny housers graphic that came out today! You can see it here. P.P.S. I did finally get stamped drawings from the engineer, and it cost me $632.50. I couldn’t predict every little thing and research it all before starting the build, because I never would’ve started. There are some things that just don’t come up until it’s time to do them. So I’ve had to continue researching regularly as the build has progressed. This month it’s been about siding: installing it, trim, rain screens, bug screens and soffits, what materials to use and how to put it all together into one working system. Did you know that exterior window trim is not very common at all? Tiny houses often have painted wood around the windows for a pop of colour. That’s how I’ve always pictured my house, but looking at regular houses around here, most just have fake shutters. The siding meets up with the vinyl around modern windows and that’s all you need. So there’s not really any style options for exterior window trim because no one bothers with it. So I’m spending extra money, time, effort, and weight on the house just to add some colour. 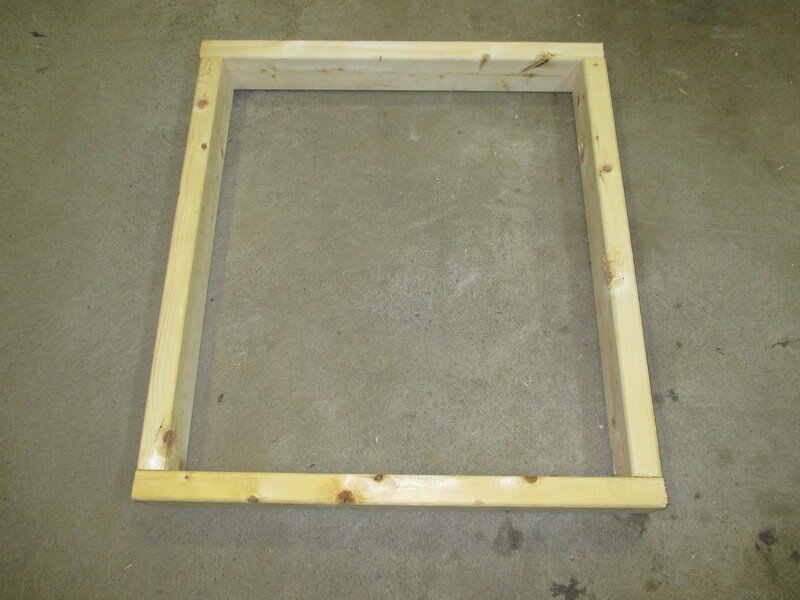 My mind was already made up, so I decided on simple 1.5″ x 3.5″ wood for the trim, with angled pieces above the windows so the rain doesn’t collect. As for a rain screen, it is highly recommended for behind wood siding, if not required. A rain screen is basically an air gap between the house wrap and siding, created by vertical strips of wood, that allows water/condensation to drain down the wall and out the bottom. However, a lot of houses have vinyl siding – which creates its own air gap – these days, so it was harder to find info and materials for a rain screen. Tiny Nest used plastic ventilated strips so the air can move from side to side as well as down, which they were able to order from a local building supply store. When I went asking for those, I was told, “You’re in Nova Scotia, good luck finding that!” Apparently wood siding is more common in B.C. So I went with 3/8″ thick, 1.5″ wide wood lathes for my furring strips. They of course only come in 4′ lengths even though it’d be just a bit easier if they came in 8′ lengths. I considered using strips of plywood, but it wasn’t worth the cutting. I might as well just use what everyone else uses, even though I tried to research and do better. My friend Shayne helped me put up all the full-length furring strips. I’ll put the rest up after I figure out how to integrate the rain screen with the window trim. Then there’s bug screen, a mesh at the top and bottom of the rain screen that keeps bugs from getting into the air gap. That was a pile of research too, because there isn’t really a specific product for it. I was going to use simple fiberglass screens, like you have in your windows, because that’s what Tiny Nest used. I was told that it’s a bad idea because rodents will destroy it within the first year. So I shelled out the $50 for a 12″ wide roll of mesh meant to be used for a ridge vent. Around here, apparently they cut it into strips and use it for the bug screen, so that’s what I’m doing. I cut it into 2″ strips and will hopefully have just enough for the whole house, top and bottom. My ingenious way of cutting a consistent two inches. All done! 6x 2″ wide strips totaling 120′ in length. I’ve read that rain screens can function without venting at the top, although they work better with venting at the top and bottom. But then that creates the issue of how to vent the top because there will be soffits there. Most houses have vented soffits so the question is whether or not to vent into them, but my soffits are solid, so I’m having a hard time picturing how that’s going to work. If I put my siding up to my soffits, then that will block off the venting, but if I leave a small gap, it might be visible and strange looking. Speaking of soffits, what a pain! When I went shopping for a material to cover the underneath of my overhang and eaves, I was told that people often use vented vinyl, so vinyl siding should work. The material is exactly what I wanted and it’s nice and white, but it is so difficult to cut! I have to cut it lengthwise to get the right width and I spent 3 1/2 hours cutting only a fourth of what I need. I’ll have to come up with a better way to cut it than tin snips, but so far they’ve been the only thing sharp enough, and the vinyl is far too flimsy to use power tools on. Attempting to cut off the interlocking part of the siding. The first strip finished for under the front or back eaves. Strips of wood added so I can attach the soffits. Underneath the back overhang as well. Under the sides I’ll be able to nail to the ends of the rafters. So I’ve been trying! It’s just been more than I can do in a month to get this all figured out and done right. That’s why I don’t want anyone else working on the house. Who knows if they would’ve bothered even doing a rain screen! I don’t trust people. Last year, I got a quote to get the siding put up for me, which was $1000 and it would take two days. This year, that same guy never returned my call, and a quote from a different company was $1200 and it would take a week, even though I told him all the furring strips, trim and everything would be already done. I’m not paying someone $1200 to do just the siding after doing all the trim and rain screen and soffits myself! He might’ve just been giving me a bit of a higher quote because he didn’t want to do a small job. There are some amazing professional builders out there, so I should try to remember that. But I’m very happy with how my little house is turning out to be all straight and square. Check out my previous post for more details about where I’m at right now. I was aiming for not too red/orange and not too grey, and this seemed like the best one! I’ve been going to a different hardware store, and the staff have been really helpful and gave me a great price on the stain. 🙂 I started staining on November 7th, in the heated garage (thanks parents! ), and I’ve been staining almost every day and sometimes twice a day since! I learned that the wood fibers on the smooth side of the siding get heated while the wood is being cut, creating what’s called “mill glaze”. This closes the grain of the wood from accepting stain, so I have spent several days sanding my siding as well. It’s been a process! I’ve really learned how to manage my time better and fit staining into my day, more than any other part of the build so far. With other tasks, I’ve usually been doing things for the first time so I never know how long it’s going to take. Then when I get the hang of it, I’m done and move on to another new thing. With the staining, it’s easy work, and I’ve already gotten plenty of practice, so I know exactly what to do and how long it’s going to take me. Instead of wondering how long it will take or having to wait until a day off, I know I need about two hours and I can get a decent amount done. That knowledge takes away the uncertainty that makes me hesitate. It’s easier to get out there and work on it, no matter my mood or the time of day, because I know exactly what I’m doing. I can blast my music, take the time to think, and go out to the garage rain or shine, day or night. It’s great! The one thing limiting me is space. The garage is filled with stuff for renovations in my parents’ house, and I only have so much room on the sawhorses. At first, I decided I would stain 6 boards a day. I have room for five on the sawhorses, and one more on a stack of wood. And since I’d be staining every day, I didn’t want to allot too much. I have to stain the front and back in case water gets behind the siding, so that’s a lot of staining! Doing 6 boards a day and giving them 24 hours to dry before stacking them meant that it would take me 32 days to stain all of my siding. At first, I was okay with that because I had expected it to take a long time. Plus I was probably going to get someone else to install it for me later, so my work would be done when I finished the staining. After about a week, I started doing a little more research, and any day I didn’t stain meant one more day into December I would need to stain. So I decided to start staining 12 boards a day, 6 during the day and 6 after work (I’m working 6 nights a week right now). I found more stacks in the garage to put boards on, and made room underneath the sawhorses for 3-4 boards. I also started to think about installing the siding myself. The only thing stopping me was a lack of help, and a few people offered theirs recently. I really didn’t want to spend the money and the more I thought about it, the less I wanted some stranger doing a mediocre job (or worse) on my house! I’ve done everything on it, except the welding and insulation, and I’m reluctant to let anyone else touch my house. I knew I’d have to sand some boards to get the tape residue off from the straps around the boards. And obviously I wouldn’t be able to just sand those spots. The difference between sanded (top) and not sanded. The difference between the rough (top) and smooth sides. The difference between the stained smooth (center) and rough sides. Rough on the left, smooth on the right. This is why I did the edges while I was doing the top, so any overlap would be on the rough backs of the boards, instead of the fronts. I’ve gotten pretty good at the edges though! Making room for more boards. First stack of six done, both sides. One of my sanding set-ups on a nice day. All my saw horses are in use! I sanded this down and ended up staining it. I didn’t sand the edge of the first half of this stack, and you can tell the mill glaze does affect how well the wood takes the stain. More water damage. 😦 I’ll probably cut this board and only use the dry pieces. So I’ve discovered that I’m terrified of nail guns. I’m not gonna let that stop me, but it has slowed me down. 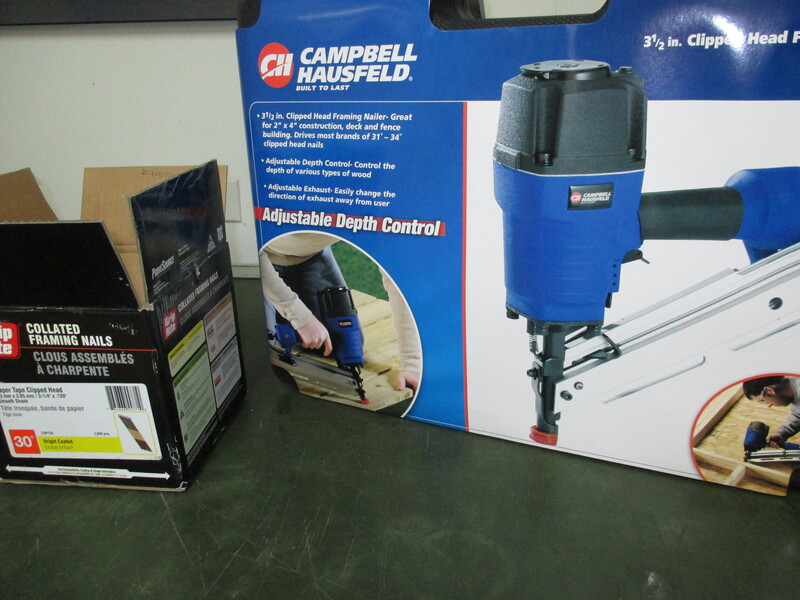 After realizing the air compressor we have is too small, I managed to borrow a bigger one. It’s amazing how sturdy it is! It was so quick to put that together! I think though with the speed of a nail gun you sacrifice some accuracy, at least in the beginning. The pieces aren’t flush, but I’m sure I’ll get better with practice. I’m nervous about how difficult the nails will be to remove when I make a framing mistake, but I’ll deal with that when it happens. I’m stuck on a few framing issues. It turns out that the roof line I want, even though it looks very simple on the outside, is so complicated! Especially because of where I want to put the windows in the end walls. Speaking of windows, I contacted the window place the supposedly sells operable octagons, and four phone calls later they were able to give me a quote: $1285. That’s PER WINDOW. “Everything has to be cut by hand.” Apparently they haven’t sold an operable octagon in over 20 years. So that’s out. I’ve decided instead to have a fixed octagon in the front of the house for the look. I wouldn’t be getting up into the storage loft to open and close a window that often anyway, although it’s a shame I won’t be able to get cross ventilation. In the sleeping loft, I’ll have an operable square, because I just know I’ll regret it in the middle of summer if I put in a fixed window. Wish me luck on my walls! Monday after my shift, I put in my wood order. Then Tuesday after work, with no new email, I called the engineer. She explained how I can change my framing so I don’t have to sacrifice any headroom 🙂 It drastically changed my wood order, but I managed to call before closing and change some numbers. The wood was delivered this morning! Does that look like enough? The framing change turned out to be easier and cheaper with less pieces. I still don’t have all the details because the engineer is really busy, but I have enough info to get started. I just hope I ordered enough wood! Then there’s windows. When I went in to order my wood, I also got a quote for windows. The main floor windows are all good to go, except the bathroom awning window. I have to make that one a bit bigger. That’s the sort of thing I wanted to find out before I started framing. Most of the windows are pretty close to budget, but I underestimated how much skylights are so I will be over budget for the category. They don’t sell operable octagons though, so I’ll have to buy those elsewhere and I may have found a place that sells them. I still have to contact them. I’m not sure what size octagon I’ll end up with, so for now I won’t frame them and they can be added in later. I really want to get started! I was originally planning to screw my framing together; it’s what I’ve done before and it’s easier to fix your mistakes. However, for speed and so I don’t have to pre-drill, I’ve decided to go with nails. 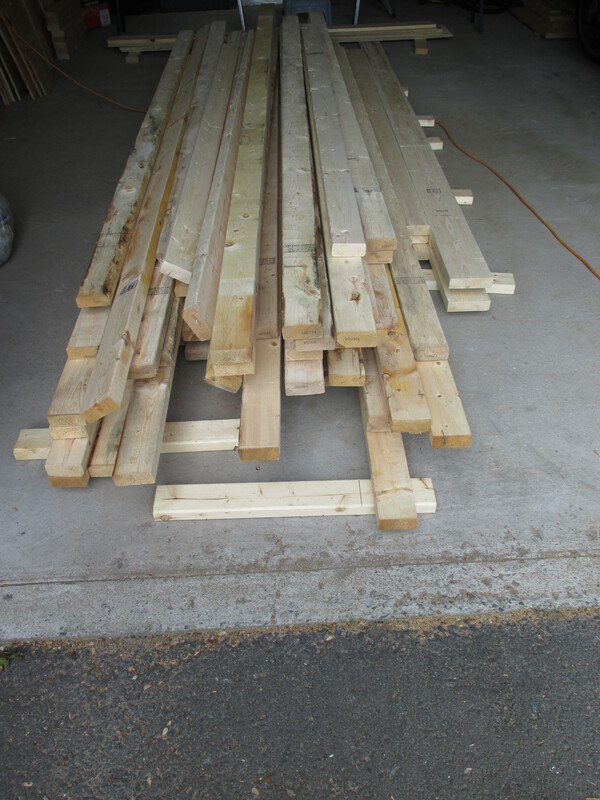 After my shift today I’ll pick up a nail gun, and if the weather holds, I’ll start putting together my end wall! I had planned on only renting a nail gun if I needed one, but a nail gun will get me through framing, sheathing, and siding, so I think it’s worth it to buy my own. Oh, and I also got a door quote. Instead of pricing a custom door, they added a cut fee for cutting down a standard door and the cost of that is ridiculous. I might end up making my own so I can make it exactly the way I want. I’m nervous about working with glass to put a window into it, but as my mum pointed out, if I can build a house, I can build a door. Let’s see what I can get done today!